One such recipe I made was Ina's Lemon Yogurt Cake. This cake was suggested by quite a few readers so I jumped in the kitchen and made it. Although Ina's lemon yogurt cake seemed delicious as is, I wanted to incorporate other ingredients for more depth of flavor. Blueberries? Raspberries? Strawberries? All those berries were great ideas but when I picked up some blackberries on sale, that sealed the deal for me. I'm a fan of lemon and blackberries (as seen in these scones I've made), but how would I incorporate it into Ina's cake recipe? I didn't want the berries to overpower the cake, so I made a glaze that would compliment the cake, rather than including blackberries in the batter. 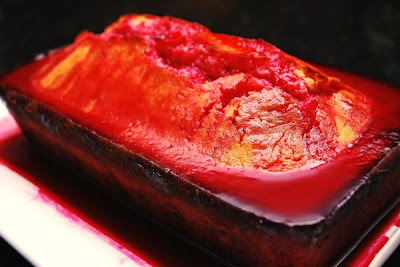 The deep reddish purple hue of the glaze was perfect aesthetically and it added just the perfect touch of sweetness and tartness to pair with the moist lemony cake. If you can't find blackberries or prefer to use another berry instead, you can certainly substitute the blackberries with whatever you'd like in the recipe below. Preheat the oven to 350 degrees F. Grease an 8 1/2 by 4 1/4 by 2 1/2-inch loaf pan. Spray your loaf pan with cooking spray. Meanwhile, combine the 1/3 cup lemon juice, the remaining 1/3 cup sugar and 1/4 cup of chopped fresh blackberries in a 1 cup measuring cup. Heat the mixture in the microwave for 2 minutes. Stir and allow it to cool. Once cooled, strain the mixture to remove any seeds and pulp. Set aside the strained liquid to use as a glaze. When the cake is done, allow it to cool in the pan for 10 minutes. Remove the loaf from the pan and carefully place on a baking rack over a sheet pan. While the cake is still warm, pour the lemon/blackberry/sugar mixture over the cake and allow it to soak in. Cool. 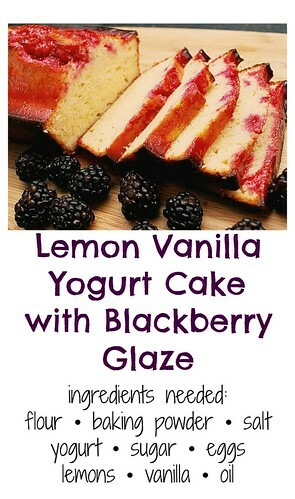 Slice and serve with excess glaze and/or homemade whipped cream. I love making this cake. The lemon and the blackberries are such a great combo. Fabulous flavors, but also so pretty to look tat as well! I love this cake recipe and your changes look like great additions! Can I use frozen blackberries for this recipe.